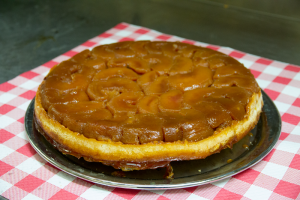 Paris is arguably the culinary capital of the world. And there are countless world-renowned restaurants in the City of Light that beckon to both locals and tourists, including Le Cinq, Restaurant Guy Savoy, La Tour d’Argent, Alain Ducasse at Plaza Athenee, Le Meurice, L’Arpege, Epicure and many others. But the vast majority of these destination eateries are outrageously expensive (easily more than $100 per person, often significantly higher, even for lunch) and are typically visited only for very special occasions. 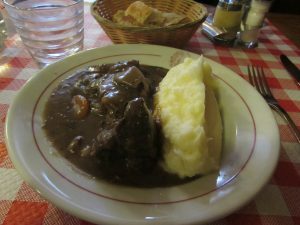 Besides, many travelers to Paris prefer to dine at authentic French bistros and cafes, where the food is affordable and prepared in time-honored fashion, often from recipes hundreds of years old. For these seekers of authentic bistro fare, there’s a true—and historic—gem on the city’s Left Bank: Le Polidor. Officially located in the 6th Arrondissement’s Saint Germain des Pres neighborhood, but really considered part of the Latin Quarter, Le Polidor offers such wonderful traditional French dishes as boeuf bourguignon, foie gras, confit de canard, blanquette de veau and even tripe, served in a setting that seems straight out of French film set in the early 1900s. In fact, the classic bistro ambiance at Le Polidor is so charming that filmmaker Woody Allen chose the restaurant for one of the pivotal scenes in his recent comedy Midnight in Paris. 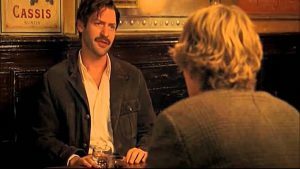 When the film’s main character Gil Pender travels back in time to Paris of the 1930s and meets one of his literary heroes, Ernest Hemingway (who really was a restaurant regular), the scene occurs inside Le Polidor. And Allen reportedly had to make only minimal changes to the restaurant’s interior before shooting the scene because the restaurant already is so evocative of the early 20th century. It’s no surprise, really, as Le Polidor was founded in 1845 and has remained virtually unchanged inside and out for more than 100 years. Step inside the Cremerie-Restaurant (more on this later) and you’ll see for yourself—and be transported back in time to Paris of yesteryear. The wood tables are narrow and rickety, covered in traditional checkered tablecloths—and lined up in long rows atop the ancient tiled floor. Huge, gilded mirrors and elaborately framed artwork line the faded amber and oak-colored walls, while the front of the restaurant provides light through traditional floor-to-ceiling windows. Wine prices and daily specials are written directly on the mirrors and windows. You want the look and feel of an old-time bistro? Le Polidor has it in spades. 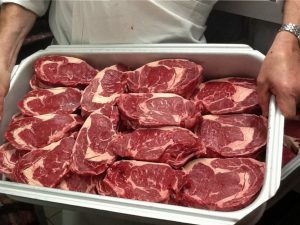 Le Polidor prides itself on serving only meat from animals raised in France. As such, it’s no surprise there’s a wealth of meat dishes—mainly French beef—to choose from. Try the entrecote with a butter-wine-shallot sauce for 19 euros, steak au poivre for 17 euros, steak frites for 11 euros, roasted beef (served for two) at 5 euros per 100 grams (order as much as you’d like! ), the beef carpaccio for 14 euros or the absolutely delightful boeuf bourguignon for 12 euros. The French tend to prefer their beef much more on the rare side than Americans, and will be cooked a point (somewhere between rare and medium-rare) unless you specify otherwise. If you want it very rare, order it saignant. Conversely, if you like well-done beef, ask for it cooked bien cuit (somewhere between medium and medium-well) or tres bien cuit (well done). Other perfect bistro classics include steak tartare, escargots, smoked salmon and the house-made foie gras. 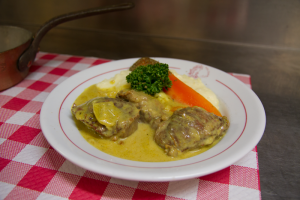 There also are daily specials for lunch and dinner (including leg of lamb, tripe and hachis parmentier, sort of the French version of shepherd’s pie) and two set formules, priced at 22 euros and 35 euros, offering a choice of appetizer, entrée and dessert. For oenphiles, there are several dozen wines to choose from, many sold by the glass. Bottles range from 16 to 100 euros, with many in the 20-30 euro range, and all the major French wine-making regions are well represented. The restaurant claims to have 20,000 bottles in reserve! 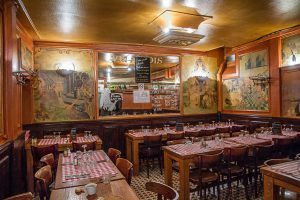 In addition to its decor and cuisine, Le Polidor is also notable for the famous artists, writers and other luminaries that were regulars over the past 150-plus years. 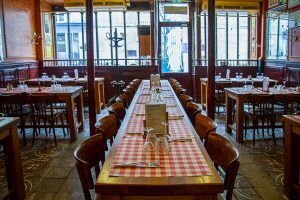 You very well could be seated in the same spot once occupied by James Joyce, Ernest Hemingway, Jack Kerouac, Victor Hugo, Paul Verlaine, Arthur Rimbaud, Henry Miller or Andre Gide, all of whom frequented the Cremerie-Restaurant. Oh, and that Cremerie matter: Le Polidor was launched as a seller of such dairy products as eggs, cheese and milk, in the mid-1800s. Later, the restaurant was opened as an adjunct of the dairy business, and featured many dishes made with the fresh dairy products the owners sold to neighborhood locals. Eventually, as the restaurant flourished, the cremerie part of the business was phased out, disappearing just a few years after the turn of the 20th century. 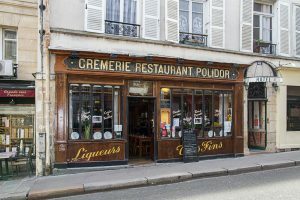 As much of the interior and exterior of the restaurant has remained unchanged since then, the Cremerie part of Le Polidor’s name remains prominently displayed on the building’s facade. Nabbing a lunch seat at Le Polidor is fairly easy, even during the noontime rush when many students from the nearby Sorbonne and College de France pop in for French comfort food. (The eatery also is just a stone’s throw from the Luxembourg gardens and the Odeon Theatre.) Dinnertime is a bit more crowded on weeknights and downright mobbed on weekends. As Le Polidor doesn’t take reservations, show up early or late for dinner if you want to be seated immediately. 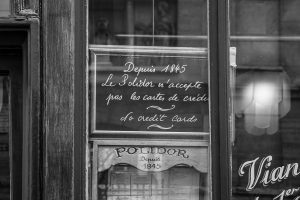 In addition to not taking reservations, Le Polidor also doesn’t accept credit cards, so be sure to bring your euros. This entry was posted in Cafes and Bistros, Famous Paris destinations, Food, French cuisine, Left Bank, Paris in Film, Restaurants and tagged Andre Gide, Arthur Rimbaud, Henry Miller, Jack Kerouac, James Joyce, Le Polidor, Midnight in Paris, Paul Verlaine, Victor Hugo, Woody Allen by Bob Adams. Bookmark the permalink.